There's probably nothing quite as exciting as a crazy ATV and off-road tour. Anyone who is looking for adventure can't go wrong with an ATV tour in Monteverde. Get ready to hit the mountainous cloud forest of Costa Rica! 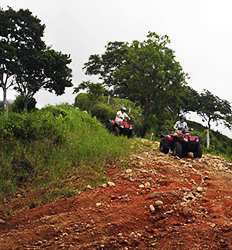 So rev ‘em up and ride like there's no tomorrow on one of our Monteverde ATV tours!! With Monteverde's distinctively mountainous and rugged landscape, any all-terrain vehicle can go "Beast Mode"...in a safe way, of course. Aside from mud-spattering, adrenaline pumping off-road fun, bring your cameras and capture all the memorable and scenic views of the Costa Rica's cloud forest along the way. Don't forget to take time to look around as you navigate the green pastures and narrow trails of dense forest. Stop and listen for the sounds of wild animals, such as sloths, monkeys, and a maybe even the elusive Splendid Quetzal birds that call the Monteverde cloud forest home. First time riding an ATV? No worries, our expert ATV tour guides will assist you all the way! On any of our extreme off-road adventures through the cloud forest in Monteverde, you can also choose to drive your own ATV, or simply enjoy the crazy ride with someone else as the pilot. There's only one guarantee here: Your Monteverde ATV tour through the cloud forest will likely be one of the most exciting moments of your Costa Rica vacation. Take a look at our selection of Monteverde ATV tours below and choose your favorite off-road adventure. The Real Deal Tours offers special tour discounts to make your trip to Monteverde not only possible, but affordable too! So what are you waiting for? Pack your bags and brace yourself as you hit the exhilarating, muddy, off-road tour only at Monteverde Cloud Forest ATV Adventure! For good clean fun that will leave you all kinds of dirty, look no further than our Monteverde Cloud Forest ATV Adventure! We'll barrel through Costa Rica's mountainous cloud forest terrain, splash through streams, & ride like we mean it. Right after a brief safety demonstration and ATV riding lesson, of course!